This very handsome apartment building was designed by J. E. R. Carpenter, the foremost architect of luxury residential buildings in the city of his generation. Carpenter lived in this building from 1924 until his death in 1932. This is one of his most sumptuous designs. His other buildings on Fifth Avenue include 810, 825, 907, 950, 988, 1030, 1035, 1060, 1115, 1120, 1143, 1150, 1165 and 1170 as well as 2 East 66th Street. Erected in 1922, the 14-story building was converted to a cooperative in 1948 and contains 26 apartments. Its top floor originally contained 20 rooms for servants and the superintendent's apartment. The finely detailed, Italian-Renaissance-palazzo style structure has an elegant, canopied entrance on the sidestreet and attractive sidewalk landscaping. 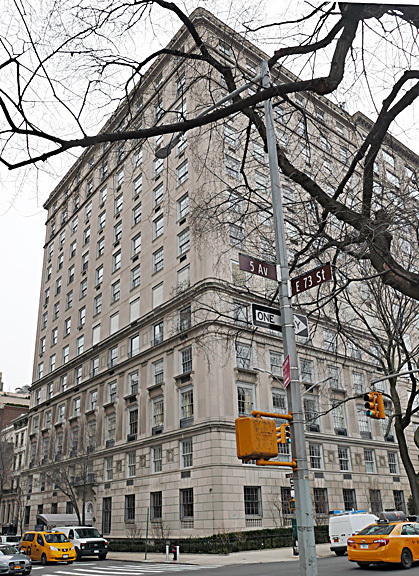 Its prime, quiet location is convenient to buses and only a block away from a major entrance to Central Park at 72nd Street and three blocks north of The Frick Collection at the south end of Fifth Avenue’s "Museum Mile." This very desirable, limestone-clad building has high ceilings, a doorman and a concierge and superb Central Park views, but no garage and no health club. For many years, the duplex maisonette apartment was occupied by Gloria Swanson, the movie star.